Chief Master Sergeant Ernst “Ernie” Buijten has passed away. Chief Buijten had been battling various health issues for the past year. Ernie’s entire family was near him, at the time of his passing. An informal viewing was held on 30 December. A funeral mass and memorial service will be held May 1st, in Lake Tahoe, Nevada. The family of Ernst Buijten were honored having members of the 435th Organization Maintenance Squadron (OMS) attend the internment of Ernst Buijten into Arlington National Cemetery, June 10, 1pm. Ernie was a wonderful friend, who filled the lives of everyone that knew him with an unforgettable ray of sunshine. He was someone who simply loved life and loved those that were blessed enough to be a part of his life. Ernie would always be there for people, to listen to their problems, and was more than willing to do everything he could to help them out. He touched the lives of all who knew him in such a special and unique way. 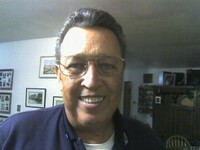 Ernie was retired and living with his wife Eva in State Line, Nevada. Before retiring, he served his country with 25+ years in the US Air Force. Ernie was always fun to be with and could bring a smile to your face in even the most difficult of times. He was a courageous man, with a wonderful sense of humor. He will always be remembered. Words cannot express the joy that he brought to all of our lives. We will always miss him and continue to miss him throughout our lives. Thanks Chief Buijten for the wonderful memories. Of me as if I were beside you there. (I'd come-I'd come, could I but find a way! I always have ... You were so good, to me! I loved you so - 'twas heaven here with you! TO the Chief: A Great and wonderful person who I will miss. I was hoping to see again at the 2009 Reunion. I was sorry to hear Ernie had passed. He will be missed.